Newly elected board members of Turkish Islamic Union for Religious Affairs or DITIB held a press conference at its headquarters in Cologne. The head of the board, Kazim Turkmen, said political disputes have prevented his organization from its essential duties and called on all sides for a fresh start. Germany’s largest Islamic umbrella group DITIB elected its new board members on January 4th. 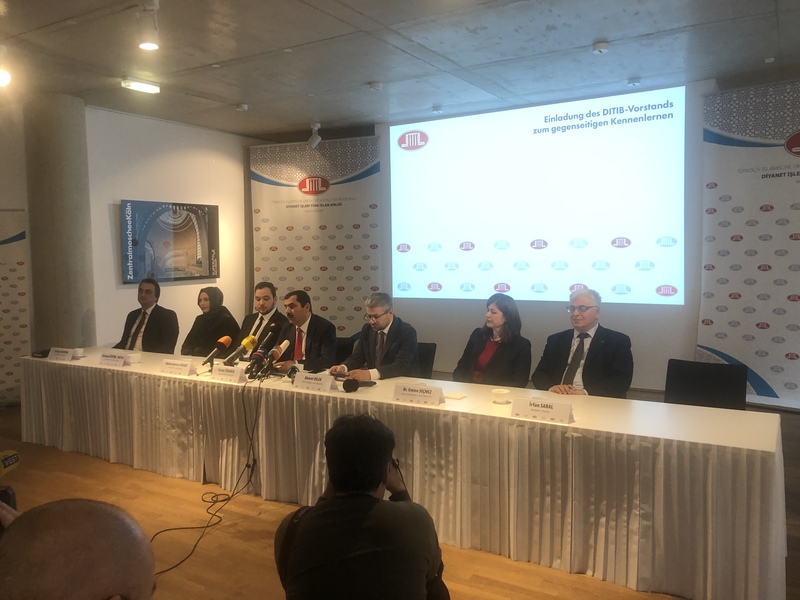 The new board members along with the president Kazim Turkmen held a much anticipated press conference in Cologne. More than 30 journalists and several German media outlets attended the event. Kazim Turkmen made comments about almost all the popular recent topics that involved DITIB. “Our finances are totally transparent. Every single euro is under scrutiny,” said Turkmen when referring to a recent Bild headline in which the picture of DITIB Central Mosque was used while asking if money was being funneled to terror groups from mosques in Germany. “We contacted Bild after the controversial headline. They told us not to press charges to investigate the matter but we will continue with the legal proceedings anyway,” said the new head of DITIB. DITIB head Turkmen said more than 30 thousand people visited its Central Mosque in Cologne in 2018. The Turkish Islamic organization has been on the forefront of the political debates in Germany during the past few years. Turkmen said his organization has not been able to carry out its essential work because of the political controversies. “We are calling for a fresh start. We will focus on our religious work. Our priority is to get recognized as a religious entity,” Turkmen underlined. He also called on German media to be more responsible editorially towards DITIB. “When there are political tensions, the number of attacks on mosques increase,” he reminded. German government has been mounting pressure on DITIB to cut ties with Turkey. The matter was also brought up by the journalists. “Social changes do not take place in one day nor should it be forced from outside. We should allow it to happen on its own and be patient about it,” Turkmen said. DITIB hosted a conference at the beginning of this month to talk about the future of Muslims in Europe. German media published the pictures of two attendees claiming they are members of Muslim Brotherhood. Turkmen said they only invited members of Muslim groups with large bases and the organization of those two people are legal entities and are in regular touch with German state institutions. DITIB launched the Central Mosque at its headquarters in Cologne in September of 2018. Turkish president Erdogan attended the inauguration ceremony but controversies surrounding it has yet to cease. DITIB was grilled by the German media for turning the inauguration into a exclusively-Turkish event. Kazim Turkmen said they invited German president Steinmeier, Chancellor Merkel as well as the mayor of Cologne but none of them wanted to attend the ceremony. The new board of DITIB said they would like to thaw the relations with German politicians and will organize a street fair in April to get together with the locals.